Can you confirm these amateur observations of Enyalioides oshaughnessyi? Diagnosis Diagnosis. Enyalioides oshaughnessyi differs from other species of Enyalioides in having dorsal scales that are both homogeneous in size, and smooth or slightly keeled. Moreover, it is the only species of Enyalioides with a bright red iris in both sexes (but see Remarks) and a dark gular patch restricted to the inner aspect of the gular fold in males. 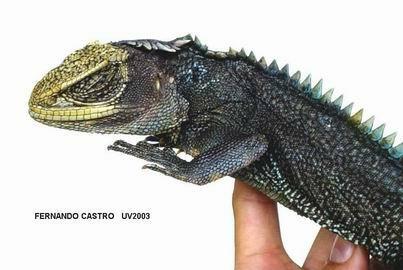 Other species of Enyalioides have a copper, brown (various tones), or bronze iris, and a dark patch (absent in E. palpebralis and some specimens of E. praestabilis) on the outer aspect of the gular fold covering the throat [from TORRES-CARVAJAL et al. 2011]. Comment Synonymy that of PETERS & OREJAS-MIRANDA 1970. Some populations previously identified as Enyalioides oshaughnessyi have been described as new species, e.g. E. altotambo. Phylogenetics: Torres-Carvajal and de Queiroz (2009) found “E. oshaughnessyi” to be paraphyletic relative to E. touzeti based on three samples of “E. oshaughnessyi”. One of them corresponded to the paratype of Enyalioides altotambo, and was sister to a clade containing the sister taxa E. touzeti and E. oshaughnessyi. Torres-Carvajal et al. (2011) noted that the color of the iris in live specimens of “E. oshaughnessyi” from Alto Tambo was not bright red as in live specimens of “E. oshaughnessyi” from other localities and suggested that the two forms represented separate species. Nonetheless, these authors found no other differences between the two potential species and refrained from associating the name E. oshaughnessyi with one versus the other because the type locality data of E. oshaughnessyi is vague (“Ecuador”), and the color of the iris was not recorded in its original description (Boulenger 1881) [TORRES-CARVAJAL et al. 2015]. Etymology Named after A. W. E. O’Shaughnessy, herpetologist of the British Museum.